Enabling all students to achieve to their potential through quality instructional programs and a shared commitment to continuous improvement. Seattle Public Schools is the largest public school district in the state of Washington. The school district serves the entire city of Seattle. As of 2018, 113 schools are operated by the district, which serve at least 47,000 students throughout the city. The Board of Directors for Seattle Public Schools is an elected body representing seven geographical regions, known as Districts, within the City of Seattle. The length of the term is four years. Board meetings are generally held twice monthly. For the 2015-16 school year, board meetings were scheduled for the first and third Wednesdays of each month, at 4:15 p.m., with some exceptions. Its headquarters are in the John Stanford Center for Educational Excellence. Thomas E. Peiser photographed a 1905 historical marker commemorating the site of Seattle's first school. According to the marker: On this spot the first school in Seattle was taught by Mrs Catherine P. Blaine in January 1854. This tablet was erected by the Washington University State Historical Society November 13, 1905. Eagle Brass Fdy (foundry) Seattle. Six Seattle public elementary schools in 1900. Like most city school systems, the district has had to face controversy dealing with problems concerning racial tension, student population assignments, and administrative scandal; such incidences include a student boycott in 1966 and using "racial tie-breakers" which led to a 2007 supreme court case. When the University of Washington was founded as the Territorial University in 1861, its initial class offerings were not at a level that would now be considered those of a college or university. Its first class offering was a primary school (elementary school) taught by Asa Mercer, and for some years it was jointly supervised by the newly formed Seattle School Board its own Board of Regents. It functioned as Seattle's first public school. In 1867, the public school moved to what was then the County Building on Third Avenue between James and Jefferson, the site of today's Prefontaine Fountain. A year later, the school moved to Yesler's Pavilion (later Yesler's Hall) at present-day First and Cherry. A year later the school moved again to a temporary building (called Bacon's Hall after its first teacher, Carrie Bacon) located at the site of the present King County Court House. In 1870 the first "permanent" school building, the Central School, opened on Third Avenue between Madison and Spring Streets. It originally had two classrooms; a third was built in its attic in 1881. Meanwhile, in 1873 the two-room North School opened at Third and Pine, and in 1875 the school district had purchased 1.4 acres (5,700 m2) at 6th and Madison, where the Sixth Street School, also known as Eastern School, opened promptly in a temporary building and grew into successively larger and better-built buildings in 1877 and 1883. The latter, an "elegant wooden building" with an imposing "French mansard roof, clock tower, and tall central belfry" superseded the old Central School as well as the North School. From 1884, it was known as the Central School. Classes extended through 12th grade, and the first class graduated from 12th grade in 1886. However the school burned in 1888. The district had, in this period, started a number of other schools, including the even more imposing Denny School on Battery Street between 5th and 6th Avenues in Belltown, opened 1884. Described as "an architectural jewel... the finest schoolhouse on the West Coast," it was demolished in 1928 as part of the Denny Regrade project. When the Central School burned in 1888, its high school and first grade classes were parcelled out to the Denny School, other classes to the former downtown building of the university, with other classes going to temporary facilities, some of which also burned, in the Great Seattle Fire. A new brick Central School opened in 1889 at Seventh and Madison, and was repeatedly expanded with annexes and extensions. After a separate high school opened in 1902, the Central School was briefly known in 1903 as the Washington School before returning to its older name. The Central School functioned as an elementary school until 1938, and then until 1949 as the Central Branch of the Edison Technical School. The building was fatally damaged by the 1949 earthquake and razed in 1953; its site is now under Interstate 5. In 1919 there were 64 grammar schools, six high schools, two parental schools (comparable to today's youth detention centers), a school for the deaf, and nine "special schools... for pupils who do not progress normally in regular classes." In the early 20th century, Seattle Public Schools were "exemplary" under the leadership (1901–1922) of superintendent Frank B. Cooper and a series of "civic-minded progressives" who served on the Seattle school board. In 2005, it was revealed that a teacher at Broadview-Thomson Elementary had been serially molesting children at the school for a period spanning several years. The teacher, Laurence E. "Shayne" Hill, had been molesting children for at least four of the twelve years he worked at the school, according to the Seattle Weekly. The article also said that several school officials had known of the inappropriate touching and did nothing to stop it, drawing outrage from concerned parents. Hill is serving his sentence as of 12/02/05 and is facing anywhere from five years to life. In June 2006, Andrew J. Coulson of the Cato Institute wrote a column in the Seattle Post Intelligencer taking the district to task for a page on "equity and race relations" on its website that indicated, in his words, that "only whites can be racist in America" and which, among other things, stated that "Emphasizing individualism as opposed to a more collective ideology" and that this and preferring a "future time orientation" were forms of "cultural racism." The page was removed from the site the same day. In June 2007, the United States Supreme Court decided the case of Parents Involved in Community Schools v. Seattle School District No. 1, where they rejected Seattle Public Schools longstanding use of "racial tie-breakers" in assigning students to schools. The decision prohibited assigning students to public schools solely for the purpose of achieving racial integration and declined to recognize racial balancing as a compelling state interest. In a fragmented opinion delivered by Chief Justice John Roberts, five justices held that the School Boards did not present any "compelling state interest" that would justify the assignment of school seats on the basis of race. Chief Justice Roberts wrote that "the way to stop discrimination on the basis of race is to stop discriminating on the basis of race." Associate Justice Anthony Kennedy filed a concurrence that presented a more narrow interpretation, stating that schools may use "race conscious" means to achieve diversity in schools but that the schools at issue in this case did not use a sufficient narrow tailoring of their plans to sustain their goals. Four justices dissented from the Court's conclusions. In January 2013, the entire teaching body of Garfield High School refused to administer the standardized Measures of Academic Progress, or MAP, which is administered system-wide, three times per year. The teachers called the tests useless and a waste of instructional time. The American Federation of Teachers has endorsed the school's boycott of the tests. Garfield's boycott of the test quickly expanded to other Seattle schools and drew national attention. In May 2013 Superintendent Jose Banda announced that the Seattle School District will no longer require MAP tests at city high schools. 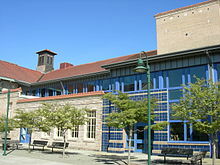 Broadway High School, incorporated into Seattle Central Community College. Old Frank B. Cooper Elementary School, now Youngstown Cultural Arts Center. Interlake Public School, now Wallingford Center. As of the 2017-18 school year, 33.9% of students are eligible for the free or reduced price meal programs. ^ Hazard, Joseph T., Early History of the Seattle Public Schools, Seattle Retired Teachers Association, 1955. Accessed online 2008-06-02. ^ Seattle Public Schools, FY 2015-16 Operating Budget, Seattle Public Schools, September 09, 2015. Accessed online 2015-02-21. ^ a b Seattle Public Schools, SPS District Vision, Mission and Core Beliefs, Seattle Public Schools, date unknown. Accessed online 2008-09-16. ^ a b Washington State Office of the Superintendent for Public Instruction, Total Enrollment Gender & Ethnicity Report, Washington State OSPI, January 25, 2008. Accessed online 30 May 2008. ^ Washington State Office of the Superintendent for Public Instruction, Washington State Report Card 2007-08, Washington State OSPI, August 26, 2008. Accessed online 2008-09-16. ^ "School Board Meeting Dates". Seattle Public Schools. Retrieved 2016-05-16. ^ "Map and Driving Directions." Seattle Public Schools. Accessed online 2016-05-16. "Seattle Public Schools John Stanford Center for Educational Excellence 2445 3rd Avenue South Seattle, WA 98134"
^ "School Board". Seattle Public Schools. Retrieved 2016-05-16. ^ a b (Thompson & Marr 2002): University; archived 3 June 2009. ^ (Thompson & Marr 2002): Central I; archived 3 June 2009. ^ (Thompson & Marr 2002): North; archived 3 June 2009. ^ a b c d (Thompson & Marr 2002): Central II; archived 3 June 2009. ^ (Thompson & Marr 2002): Denny; archived 3 June 2009. ^ Fleming, S. E. (1919), Civics (supplement): Seattle King County, Seattle: Seattle Public Schools. p. 41. ^ Digest of pages 283-295 of Polk's Seattle City Directory 1919, accessed online 9 December 2007. This is the source for there being 9 special schools. ^ a b Bryce E. Nelson, quoted by Richard C. Berner, Seattle 1900-1920: From Boomtown, Urban Turbulence, to Restoration, Charles Press (1991), ISBN 0-9629889-0-1, p. 77. ^ Andrew J. Coulson, Planning ahead is considered racist?, Seattle Post Intelligencer, June 1, 2006. Accessed online 10 December 2007. ^ Equity and Race Relations: Definitions of Racism, Seattle Public Schools, archived June 22, 2006 on the Internet Archive. ^ Debera Carlton Harrell, School district pulls Web site after examples of racism spark controversy, June 2, 2006. Accessed online 10 December 2007. ^ High court rejects JCPS student assignment plan, Associated Press, July 5, 2007, on site of WAVE 3 TV, Louisville, Kentucky. Accessed online 10 December 2007. ^ Linda Shaw, U.S. Supreme Court rejects Seattle's racial criteria, Seattle Times, June 29, 2007. Accessed online 10 December 2007. ^ a b c "Seattle Public Schools P223 Enrollment Report" (PDF). Seattle Public Schools. Retrieved 4 July 2018. ^ a b "About Seattle Public Schools". www.seattleschools.org. Seattle Public Schools. Retrieved 4 July 2018. School Lists from the 1919 Seattle Polk Directory; digest of pages 283-295 of Polk's Seattle City Directory 1919, Polk's Seattle Directory Co. (1919), accessed online 9 December 2007. Thompson, Nile; Marr, Carolyn (2002). "Building for learning - Seattle Public Schools Histories, 1862-2000". Seattle: Seattle Public Schools. Archived from the original on 2009-06-03. Retrieved 2007-12-09 . Apparently no ISBN. Originally available online as a series of PDFs, which are now on the Internet Archive. As of 2018, all of the chapters are available as HTML on HistoryLink, but they do not provide a table of contents; chapters can be found via https://www.google.com/search?&q=site%3AHistorylink.org+"Building+for+Learning"
Wikimedia Commons has media related to Seattle Public Schools. This page was last edited on 21 January 2019, at 23:28 (UTC).